Our site contains a collection of Dodge Lil Red Express Truck’s submitted by visitors of the 440 Magnum Mopar Enthusiast Network. 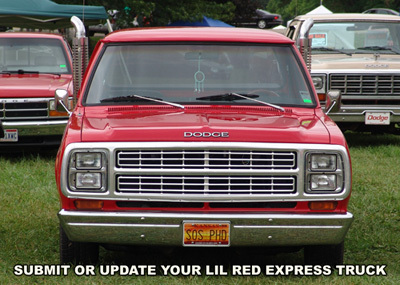 To participate you must submit us a photo and description of your Dodge Lil Red Express Truck. If you would like to have your Dodge Lil Red Express Truck featured or updated, this section will provide you the information to submit your ride. Your name, your email address (So we may contact you concerning your feature), Year of your Dodge Lil Red Express Truck, etc. We will also provide you the opportunity to include additional information in your description. This could include things like, how long you have owned your Dodge Lil Red Express Truck, any clubs you belong to, any modifications you have made to your Dodge Lil Red Express Truck and what you enjoy about your Mopar. We also require that you provide us at least 1 or more good quality photos. Submitted photos need to be at least 500 pixels wide or larger. We accept photos in the jpg (the best), bmp, or gif file format. You may also submit photos zipped (compressed .zip). Ready to have your Dodge Lil Red Express Truck featured or updated? Please Note: All Dodge Lil Red Express Truck entries and updates are possessed by hand, normally within 72 hours. Submitting your Dodge Lil Red Express Truck also makes your Mopar eligible for next months Mopars Of The Month site.